The college football fans who are convinced there is bias for the Southeastern Conference in The Associated Press college football poll have a lot to complain about this week. The SEC placed a season-high eight teams in the Top 25 released Sunday, including the only three ranked teams that have lost twice. Maybe the haters have a point? No. 21 Auburn has been slogging along offensively all season and dropped to 4-2 after losing at Mississippi State on Saturday night. The Bulldogs snapped a two-game losing streak against the Tigers and landed at No. 24 in the new rankings. Texas A&M (4-2) re-entered the rankings after a 20-14 victory at home against previously unbeaten Kentucky in another grinder of a game. The Wildcats slipped five spots to No. 18. No. 14 Florida jumped eights spots for beating LSU, which slipped from No. 5 to No. 13. Meanwhile, other teams such has Stanford, Oklahoma State and Virginia Tech, slipped all the way out of the rankings Sunday after a second loss. TCU, which has lost only to Ohio State and Texas, is buried in the others receiving votes. Iowa (4-1) was first out of the Top 25. Washington State (5-1) is not even close. What gives? In October 2014, when the SEC had four of the top five teams in the rankings, research done by STATS showed that in the previous five seasons , SEC teams did not seem to be getting treated differently from other teams by poll voters when it came to movement (up or down the rankings) after conference games. There was no obvious preferential treatment for SEC teams found. As for this season, Auburn is still riding its victory against No. 7 Washington. Texas A&M’s two losses are to No. 1 Alabama and No. 4 Clemson. Mississippi State gets a bounce based on beating Auburn, which beat Washington, and losing to Florida and Kentucky, which have only lost to other SEC teams. Instead of cannibalizing each other, SEC teams are propping each other up, buttressed by the league’s quality nonconference performance. Heat check understands the complaints and is also a little suspicious of continuing to reward slipping Auburn, and then in rewarding Mississippi State for beating Auburn. Though It also should be noted that S&P , an analytic ranking based on play-by-play data, and the Sagarin Rating also have those eight SEC teams in the top 25. The Crimson Tide is allowing 4.9 yards per play, which is 28th in the nation and would be the worst mark for the Tide’s defense since 2007. Next: at No. 13 LSU. QB Jake Fromm has not gotten the type of attention Tua Tagovailoa and Dwayne Haskins have, but he is the fourth-most efficient passer in the country and could start drawing some Heisman buzz as the Bulldogs enter a challenging stretch of schedule. Heat check: A touch too hot. Flip with Ohio State. The defensive issues persist. The Buckeyes are a thoroughly mediocre 60th in the nation at 5.42 yards per play. Next: No. 20 North Carolina State, Oct. 20. Behind RB Travis Etienne, the Tigers are fifth in the country in rushing yards per game (280.93) and have the second-best average per carry (6.96). Mercurial TB Dexter Williams has given the Irish running game a home-run hitter the last two games with 339 yards and an 8.92 average per carry. With three top-eight teams losing Saturday, the Mountaineers got a raise by virtue of others dropping. Next: at No. 17 Oregon. The worst-case scenario for the Huskies is Auburn tanks and the opener is not even a quality loss. Must have been hard for Penn State fans to watch Indiana pass all over Ohio State and not start thinking about that fourth-and-5 run. Always lots of talk about body of work when ranking teams, but at some point you have to acknowledge a team is getting better. This isn’t the team that lost to Maryland. Interesting to see what the ceiling will be on the Knights. At some point the lack of signature victories will stall their climb. Next: at TCU, Oct. 20. Looks like Sooners fans will finally get their wish: A new defensive coordinator. The Wolverines are exactly where we figured they would be when they left Notre Dame after losing week one: Riding a five-game winning streak, but still looking for a big win. Heat check: Too cold. Heat check is setting itself up to be disappointed by the Wolverines. Next: vs. No. 2 Georgia. The resume still says top-10, but nothing else suggests the Tigers are capable of beating elite teams, like Georgia and Alabama. Heat check: For now, respect the resume. Too cold. Florida and LSU are basically the same team. So-so offense. Strong defense. Good kickers. Riding the plus-turnover margin to success. Heat check: Too cold, but only a little. Next: at No. 12 Michigan. The Badgers’ defense, thinned by injuries in the secondary, is not its usual stingy self (6.01 yards per play, 100th in the nation). For the Hurricanes, there are no bad wins against Florida State. Next: vs. No. 7 Washington. Last chance for the Ducks to be relevant comes against Washington. Next: vs. Vanderbilt, Oct. 20. Back to being a basketball school. The weak schedule is still holding the Buffaloes back. Next: at No. 4 Clemson, Oct. 20. Larrell Murchison and James Smith-Williams anchor a rebuilt defensive front that is holding its own after the Wolfpack had four linemen drafted. Always lots of talk about body of work when ranking teams, but at some point you have to acknowledge a team is getting worse. This is not the same team that beat Washington. The most deserving of the two-loss SEC teams. Close victories against Illinois and Georgia Tech are looking better than expected. Next: at LSU, Oct. 20. Beating Auburn should not carry this much weight. Next: at Temple, Oct. 20. The Bearcats are a great turnaround story, but the back half of the schedule is more challenging. 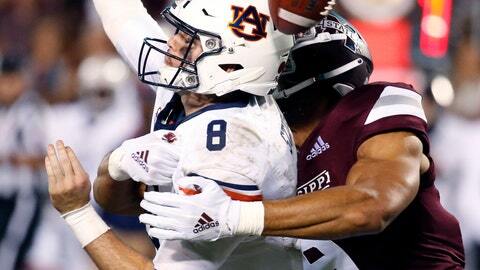 Should be out: Auburn, Mississippi State and Cincinnati. Should be in: Iowa, Washington State and Appalachian State.